nuuncreator of the sugar-free quick-dissolving electrolyte sports drink tablethas added a new flavor to its family in 2008orange ginger. Orange ginger is nuun's fifth flavorit joins lemon+lime, tri-berry, citrus fruit and kona cola to gives cyclists and runners more choices in the replenishing electrolyte drink. Orange-ginger is available in two sizes. Each tablet of nuun makes 16 ounces of drink, approximately the size of a bicycle bottle. bigger nuun has a larger tablet size specifically formatted for ease of use in larger 32-ounce or liter-sized bottles and hydration packs. nuun was the first electrolyte drink ideally suited for use in hydration systems, because its sugar-free formula rinses cleanly and will not fuel the growth of bacteria. In 2008, a tube of bigger nuun is included with the purchase of Deuter hydration packs. 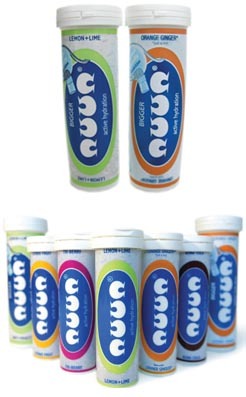 When nuun came to market in 2004, it offered active people a new way to hydrate. nuun's conceptto separate what you drink to stay hydrated from what you eat for energydefined a new way to replenish electrolytes in a convenient, easy-to-use form. Simply add a tablet to water, let it dissolve for two minutes, and you have a drink containing calcium, sodium, potassium and magnesiumthe essential electrolytes that aid hydration.